We’re back to “normal” this week. At least as normal as things really get around here. I’ve been spending a lot of time working on building the website and the patreon for the show. Of course that means I haven’t been nearly as productive as I’d have liked to have been. But we did get a new Shark. That’s exciting right? The news this week gets us back to those standard stories of drugs, bad judgement, and plain old stupidity. 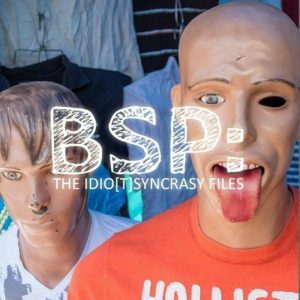 The “Jackass of The Week” puts a new twist on the old excuse, “it’s not mine.” Finally, in Recommended Listening, I’m getting back to guests from the Livestream For The Cure with another Phoenix based show: BSP: The Idio[t]Syncracy Files. The newest viral challenge trending from YouTube is neither new nor trending. It turns out that the “Condom Challenge” that has been making the rounds through news outlets recently, actually stems from a teachers’ education course that used videos of teens snorting condoms through their noses, among other videos from several years ago, to show the dangers of dares in teen behavior. A local news station, that was at the event, falsely reported that the condom snorting challenge was the newest internet trend sweeping YouTube, even though the videos shown were from 2013. After the Marion Hotel refused to serve them, the Manitoba Nomads charter of the Hells Angels decided to retaliate in the most Canadian way possible. They flooded them with 1 star reviews. The charter president put out a call to leave negative reviews across multiple platforms which managed do drop the hotel’s 4.5 star rating down to 3 stars overnight. When the head of the police force in Pilar, near Buenos Aires was transferred, the incoming commander noticed a discrepancy in the evidence inventory. 540 kg (approximately 1190 lbs) of the noted 6000 kg of marijuana that was supposed to be in evidence was unaccounted for. When asked about it, the former commander and his deputies claimed that rats had eaten it. An investigation found no evidence of rodent infestation, and noted that if rats had eaten the marijuana, they would have died. When a Florida woman was pulled over by police for swerving in traffic, officers noticed the scent of marijuana and searched the vehicle. In the woman’s purse were several bags of marijuana and cocaine. The pot she admitted was hers, but she claimed that the cocaine was not, and it must have been blown through her car window and into her purse by the wind. BSP: The Idio[t]synchrasy Files is a podcast that delves into strange and humorous phenomena including seeing Jesus on your toast, supernatural sightings, crypto-zoology, and so much more. Cody and Chris have created a platform on which they can discuss both sides of the phenomena (real or bulls**t) while sipping on booze and spirits that represent their chosen topic. They hope to entertain, enlighten, and maybe even educate you on all things fun and weird. Who’s side will you be on? Are you a believer or a skeptic?